We went for a four mile hike around Taughannock Falls and Oscar was leading the way. There were some muddy parts and his under carriage got pretty dirty. 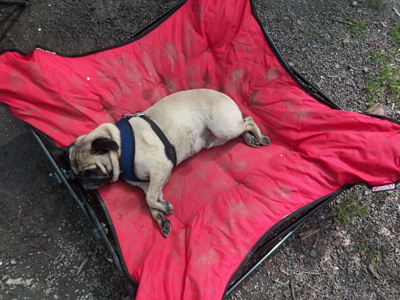 He was also pretty pooped by the time we got back to the campsite. Don't you LOVE the Puppia harness?!? I know I do. My pug has a red one. We do love the Puppia harness. It needed cleaning after his camping adventure! 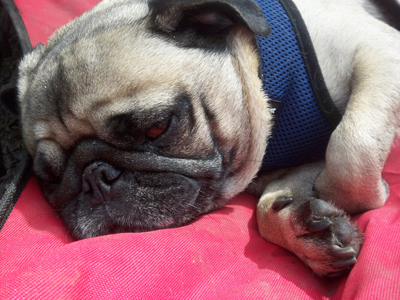 I have a similar picture of our dog after a day camping at the lake like your middle picture. Don't you love knowing they are having as much fun as you? That is one pooped out puppy alright, I bet he slept well.